Tim Bawden of the I newspaper informs us that this could be the coldest spring for 50 years and could even end up being the coldest since 1962. However if the weather in Durham and District can repeat or better its 1960 trick – you are in for a great June 2013! 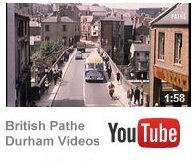 We had only 7 [Seven] rainy days in the area of Ushaw Moor/Durham City of June 1960 vintage. There were 237.6 hours of sunshine – equating to a mean average of 7.92 hours per day. The hottest day achieved 79 degrees F. and that occurred on the second day of the Durham regatta. [Durham University Observation data]. So it was a sunny June. The snag for Ushaw Moor Cricket Club is that Raine poured on its team. Put another way, Bearpark beat Ushaw Moor in a Northern Echo Cup semi-final. Raine scored 60 in Bearpark’s total of 134 for 4. In reply Ushaw Moor was all out for 82. The damage was done by that man Raine’s fine bowling [5 wickets for 23 runs]. The Irish in County Durham and Newcastle c1840 -1880. The material I have in mind starts on page 213 of Roger Cooler’s doctoral thesis [ Durham University]. I assume that soon afterwards his title would have been Dr. R Cooler. I came across Last resting place.com. It can get you into Ushaw Moor cemetery – in a manner of speaking – with some details and photographs; this could be especially useful for family historians, and such like, that live some distance away.